Below is the transcript from a call on September 17, 2016 at 9 a.m. PDT, the second in a series of the Global Read program (details here). The Global Read is an opportunity for individuals and organizations who support making compassion a luminous force in our world to join with thinkers and activists who are also authors in an open discussion about how to transform the world. If you'd like to listen to the audio of the call, click here. Marilyn: Good day everyone, this is Marilyn Turkovich from the Charter for Compassion. Welcome to our second Global Read! We are very excited to have Mark Gerzon with us today. The Huffingon Post has referred to Mark as an expert and a veteran convener of cross-party conversations. I have spent a little bit of time with Mark in relation to an organization that he and some others founded called the Bridge Alliance and I can assure you that that’s what Mark is – that kind of person that is a great listener. 20 years ago he co-designd and facilitated the first U.S. house of representatives bipartisan congressional retreat. He’s been at the forefront of these types of dialogues. His previous book, Leading Through Conflict: How Sucucessful Leaders Transform Differences Into Opportunities, came out in 2006 and was published by Harvard Business School Press. I think this is the first real journey into transpartisan learning that he had and shared with others. Having worked in both the private and public sectors here and internationally, Mark’s primary focus is having a positive impact on the 2016 elections. The Reunited States of America: How We Can Bridge the Partisan Divide introduces and shares some of the principals and profiles of leading figures involved in this very important movement and I think that we can see that each day as we read the news and look at the film clips coming out. This book has been endorsed by leading figures on both right and left and highlights individuals and organizations who are working hard at bridging the political divide. It is my pleasure to introduce Mark. Mark: Marilyn, thank you very much. I’m delighted to be part of this book club conversation. I will refer to my book but I’ll also just tell you a little about myself. I’ll also tell you if you want to dive deeper into this (than we can do here), the Shift Network is currently in the middle of a course that I’m hosting called “Healing Our Political Divides” and there I’m going deeper into the story and skills that one needs to cross the partisan divide. But I’d like to start by saying that this community that’s on this book club call today and some other communities emerging around America are part of what I call a transpartisan transformation. By that I mean that we’re starting to wake up from the trance that red or blue will fix things and realize that we live in a Technicolor America and that each of us have to be part of that transformation. For me that transformation is developing my capacity to deal effectively with people all across the political spectrum. Now developing that capacity, that’s useful for me within my family – I’ve got political differences within my extended family. I’ve got them in my community, at work, between the next generation, around race, and certainly around politics. So it’s not like the transpartisan transformation is only useful when it comes to politics. I’m finding it useful in every part of my life, including my health! I’ll talk about that a little more in a moment. But first, let me say a little more about the story that Marilyn was referring to. I grew up about as red or conservative as they come – I was a product of my childhood. I grew up in a very conservative time and place: the 1950s in Indianapolis, Indiana. The KKK was very active in our area; it was just a very conservative place that always voted republican. At age 17 I left for Harvard College and found myself in one of the most liberal places at one of the most radical times – Cambridge Massachusetts in the late 1960s. By the time I was an adult I was clearly red and blue. I’m telling you that to start with because some of you, when you look at your own biographies will say “well I’ve got some red and some blue in me.” I refuse to cut off part of myself to pretend that I fit in one of these boxes, and I refuse to cut off part of myself to be part of one of these parties. I have preferences. But I don’t want to be a prisoner of my preferences and I don’t want to be caught in the illusion that who I vote for on November 9th is going to make America better. I have to equally attend to (and that’s what I want to talk a little more deeply about) on November 10th and the relationship between the winner and the loser, ultimately things get done because the parties work together or they don’t. 1. I’m a liberal, elect me, I’ll fix it. 2. I’m a conservative, elect me, I’ll fix it. 3. We have differences and we need to work together to fix anything. I believe it is that third narrative that will gain ground. The only time we saw that this summer at the two conventions was briefly when Michael Bloomberg gave his speech. He said “I’m going to give an unconventional speech. I’m not a democrat or a republican. I’m for Hillary Clinton, I think she’s going to make the best president. But I’m not here because she’s got a ‘D’ behind her name - I’m here to endorse her because I think she’ll make a better president.” He made clear that he was not a party person, did not want to be a party person, and thought that parties were part of the problem. So with that background, let me tell you a little about how I see this, and the frame that I bring to it. 1. Commitment – a total commitment to be a learner. Yes I have my opinion about abortion, climate change, immigration, but I am here to learn. That’s what the founding fathers wanted! They set in motion a set of principals, but they wanted us to be learners. Some of you on the call may care about additives of GMOs in food, about ISIS, about internet privacy, about environment protection, about outsourcing jobs to China or Mexico, and lets’ face it – the founding fathers cannot help us. Those issues didn’t exist in 1776. We can’t go back to the constitution to fix these things. We have to be learners. Jefferson said that – every generation needs to reinvent democracy. And we can’t do that without learning. We can’t solve the problem of making our schools safer around the issue of guns without learning. We cannot solve climate change without learning. For every principal I share, I’ll give an example. ex: When it comes to learning I really want to recommend www.Allsides.com – a site by a friend of mine CEO John Gable. What John has essentially done is brought news from the left and right side all into one place. So you can have Fox News, MSNBC, and CNN in one place. You can see the news from a triple perspective every day. You can start to practice that multiple perspectives that’s at the heart of being a transpartisan. And you can really hone that down. He’s taken it to the schools with my colleague Joan Blades who started Living Room Conversations. And the goal is to let kids see the news from the left right center perspective every day. And they can start thinking for themselves. Because when you have multiple perspectives all presented with respect – you have to start thinking for yourself. 2. Relationship – you recognize that you have your point of view, but you’re also committed to the quality of the relationship. In our marriages or families or with our coworkers, it’s almost a truism to say that relationship matters. But when we talk about politics, no one talks about relationship. I feel that we need to wake up from that trance and realize that relationships will determine what happens in the next four years. When your president of choice is being obstructed by the other side, they can’t do very much. We have a more paralyzed country rather than a partisan country. We are almost incapable of dealing with the pressing problems we are faced with. And other nations will take advantage of that. Former assistant secretary of State, Hal Saunders, has written a book called Politics is About Relationships. Read that and you’ll see that this fundamentally feminine principal of valuing relationships is absolutely at the heart of politics. Of course that’s where compassion comes in as well. Compassion is at the heart of politics. ex: Convergence Center for Policy Resolution (D.C.) – Convergence is a wonderful project started by a friend of mine, Rob Fersh. Convergence brings people together from across the political spectrum on tough issues like education, dealing with Iran or Iraq, immigration, and they’re bringing people together for sustained problem solving dialogues. 3. From Position Taking to Problem Solving – that is a fundamental shift in consciousness. Why are we engaged as citizens in a civic issue? Are you engaged because you’re trying to push your position, or because you want to actually solve the problem, make things better. When I’ve talked to pro gun or anti gun folks, I can’t let them stay in their pro or anti gun frame of mind. When people are stuck in those positions, nothing changes. So I say, “Imagine your children go to the same school. Tomorrow you want them to be safer than they are today. What choices would you make with the other parents, knowing that some of the other parents have that other point of view?” Suddenly we go out of position taking and we have to get to problem solving. ex: Every Day Democracy (Hartford, Connecticut) - They’re actually doing on the ground problem solving of community issues. They’ve done an extraordinary job of going into a community that has a problem that they want to solve and bringing all the stake holders together. This is I started in the field, by being a community problems solver working with the Rockefeller foundation around a project that I called the common enterprise. I basically had persuaded the Rockefeller foundation that if they funded liberal projects there would be conservative foundations funding conservative projects. So I said you know why don’t you fund liberals and conservatives coming together in a common enterprise in their community – fund that instead, fund problem solving. 4. From campaigning to governance – This really takes us into the political sphere. I think it’s a shift that is essential. Campaigning is stuck in all those old words – it’s not about relationship or learning; it’s about position taking, winning, confirming what the person already believes. But the reason the transition from campaigning to governing is so important is because it used to be that campaigns went on for a few months, and then governing occurred for several years until the next campaign. In the 1990s governing started to disappear. Now it’s perpetual campaigning. We’re in a country that has almost stopped having governing. All we have is this endless campaign. So how do we shift that? We need to promote candidates and campaigning that honor the principals of governance. Ask yourself, “What will governance be like on November 10th?” If Donald Trump goes to the white house, a ton of people will try to make him as helpless and ineffective as possible. And if Hillary Clinton goes, an entire segment of the population that’s going to try to make her as lame and paralyzed as possible. We are facing a turning point where without this transpartisan transformation, we are going to be a paralyzed democracy. When a country is paralyzed, things don’t stay the same. They get worse. If you suddenly became paralyzed, there would be things that needed to get done that wouldn’t. That’s what’s happening in America today. I want to close with a comment about our bodies. Particularly on a conference call where we can’t see each other or touch each other or look each other in the eye, it’s easy to become disembodied. But our bodies are these wonderful instruments that illustrate everything I’ve just said. You’re breathing with your left and right lung, listening with left and right ear, looking at a computer screen with your left and right eye, you’ve got two hands (if you’re as fortunate as I am) that are operating and you can use. We are walking museums of left and right, all working together for a common purpose. And we have a center in our bodies that holds left and right. So to me all we have to do is look in the mirror and realize that left and right are part of the whole. The real challenge is not that we have to become enlightened to become transpartisan, we just need to become embodied. We have to stay grounded in what our bodies know, our minds know, and our souls know. I believe that physically, emotionally, and spiritually I believe we are transpartisan beings. So simply bringing our true nature into politics, I think will help to heal it. I think I will close with this comment about the new generation. I think many many millennial feel this instinctively. The data shows that there are far more millennials saying that are independent or transpartisan. I think it’s a very optimistic sign that we are going to have more and more young people saying I am not a democrat or a republican I am a problem solver. So with that Marilyn, I think I’ll turn it back to you. I look forward to your questions and the conversation that is going to ensue because I have a lot to learn myself. Thank you very much. Marilyn: Thank You Mark. You know, before I open it up I’m just wondering, have we had any examples in our history where we actually listen to one another? So many of us want to turn to the past and grab hold as an example. But have we had this, have we had leaders who are learners or compassionate listeners? Mark: My immediate answer is Eleanor Roosevelt. And I’m not saying there haven’t been others since Eleanor Roosevelt, but that was my first free association. But I also want to say that while I am interested in the past, we’re a different county now then we were before. We started out as democracy 1.0 where a small group of white men living on the east coast who owned land and had differences had to get together and work through their differences. But some people have estimated that it was less that 15% of the population when this country was founded that was actually involved in civic affairs because by the time you eliminated all the slaves and all the women and all the non land owners and all the people living in outlying areas, it was a very very small group of people who founded the country. And what’s happened now in the age of 24-7 news, we are actually becoming a nation in which 350 million people think that their voice should be heard. That’s historically unprecedented. In the past, there were always large numbers of people who were either legally or socially or economically marginalized. And all of those voices now want to be heard. Every single population wants a voice. So while there are examples from the past, we have to be learners and move forward and create a kind of democracy that’s never existed before. Marilyn: Great, thank you for that. That was wonderful. We want to collect a few questions first, and we’ll note them down, then come back and have Mark answer them individually. One of the things we want to do is introduce you to Sherri Pula, our technician. She will let you know how to collect the questions. Sherri: Thanks Marilyn. To ask your question, press 1 on your telephone (or skype or webphone) then we’ll call on you. When we call on you, I’ll let you know that your microphone is on. Let us know your name and where you’re calling from. Whenever you’re ready, we would love to hear your voices. Laurel: Thank you, my name is Laurel Kerr and I’m in Dayton Ohio. My question is: in wanting to do something proactive in this election, I do want to be part of the process, but in a way that is not divisive. So I tend to live in a more conservative area and I tend to be more liberal. I’ve decided not to do a yard sign this year, but I am making phone calls in my area. What advice would you have for me, to do this in a way that is as thoughtful as possible? Besides something I’ve already experienced which is the opportunity to be a good listener when I make those phone calls. Mark: Beautiful question, Laurel. And having grown up in the Midwest myself in a conservative neighborhood I know what it feels like. The first step that comes to my mind is start a living room conversation. A living room conversation means find a colleague or friend that is more conservative than you and possibly even voting for Trump (either reluctantly or enthusiastically) and together with that person invite a group of friends and have a conversation. You can get all the guidelines for the conversation off of www.livingroomconversations.org. I’m looking at the guidelines now as I speak to you, and its everything you said that you want. I think if you did that, and let some of the local press know, it’s just a way of sending a message. And you can go ahead and be progressive, you don’t have to change. You’re just saying “I want to listen to my neighbors and I want my neighbors to listen to me” Living room conversations is just one template for doing that. It sends the message that someone in Ohio is playing a different game. You want to play a different game. You’re not trying to change anyone’s mind, but the very fact of inviting them over and sharing food creates and brings the heart back into the center of politics. That’s one suggestion and I have very many. Good luck, and thank you for doing that in Dayton. Laurel: Thank you, I appreciate those ideas very much. Marilyn: I think this is a good time to introduce the new works of Joan Blades from Move On. She has certainly moved on to a whole new aspect of work that she’s cherishing. I think that this is something that Laurel could do, and almost everyone on this call could do, about what Joan is doing with the living room conversations. Mark: Joan’s story is to me the classic transpartisan story. She was an archetypal liberal who started www.moveon.org. She lives in Berkeley, California. She’s a wonderful soul and after several years of doing moveon.org and mobilizing liberals, she realized: “This isn’t making the country better. I’m just really part of the polarization of America.” She’s glad to be a liberal, but she wants to be a problem solver. So, all of the principals I mentioned are built into the concept of living room conversations. And you’re absolutely right Marilyn, all of you on the phone can do exactly this in your own community. I’d look into it – I think it’s a great starting point. Marilyn: Fantastic. Okay, let’s open up the phones to anyone else who might have a question. Mimi: My name is Mimi Hicklin, and I live in Kirkland, WA. Mark, you suggest "taking a vacation" from one’s own partisan beliefs, or exposing oneself to news and media from sources that one might not otherwise because of the affiliation with the "other" party. And still, you acknowledge how almost all media (on both sides) is riddled with hyperpartisanism. Do you have any personal recommendations of news sources that offer serious, multisided analysis? I took that issue and just started looking at the different points of view on that issue. What does Bernie Sanders say, what do conservatives say about it? That’s kind of my informal way of doing political cross training. You can’t do it about everything. You can’t become a political scientist. But it’s possible to learn all the different points on the circle. I call that systemic thinking. I think systemic thinking is essential in politics. What partisan politics does is systematically tells us half the truth. So minimum wage is a liberal issue that many conservatives are against. But now many conservatives are for it, because if there were a minimum wage a lot of those big government programs for the poor wouldn’t exist anymore because the minimum wage would lift so many people out of poverty. So there’s actually a liberal argument for minimum wage and conservative argument for minimum wage. So if that’s an issue that you care about, you’ll be a stronger advocate if you cross train. Become your own allsides.com on the issues you care about. Marilyn: How do you personally prepare yourself (because so many of us have that righteous side) to let that go? Do you do a lot of talking to yourself? Being a transpartisan means being willing to hold competing values. So with my family member who says we are being foolish letting these people in, there are risks, I have to ask myself: “Is that credible, honorable point on the wheel?” And I think it is. And you can see that by looking at Germany, they opened their arms wide to refugees and said “come on, we’re a safe haven” and now there’s this incredible counter reaction because of the violence that some of those refugees committed and the way that its overloading the German social services. So I really think this holding of competing values is part of being a transpartisan. It’s the exact opposite of what parties will do. They’ll say “if you care about family values, vote for us” as if the other party is against families. Or they’ll say “we’re the party if you care about freedom and liberty.” Well, obviously the other party cares about freedom and liberty. So it’s this manipulation and I believe the transpartisan approach of holding paradoxes is our best defense and also the way we can stay compassionate for people other than ourselves with fundamentally different points of view. Marilyn: Great, thank you. This might be a very good time to talk about what we’ll be doing right after the election in Utah with the Communities of Civility and Compassion and the Bridge Alliance. We’ll have a dialogue we hope we can stream so that others can take part in it. Do you want to share some of that? Mark: Yes I’d love to, and I appreciate you asking about it because it’s something folks on this call might be able to do in their own communities. For several years my colleague John Steiner and I have worked very hard to create the idea of a third convention and the idea was that after the democratic and republican conventions we would have a citizen summit to celebrate all the people who work across the divide. There are people actively working with people across the divide to keep churches, schools, and hospitals going. We were going to celebrate that at a citizen summit. In the end, we were unable to raise the money or find a city to host it at the level we had hoped. But we were very excited that our colleagues in Salt Lake City said we’re going to do a citizen summit in Salt Lake. So on November 12th there will be a citizen summit bringing together democrats republicans and independents, including high level political officials from across the state of Utah. And they’re going to be celebrating Americans who work together. As Marilyn said there’ll be an opportunity to stream into that. And in your community if you wanted to have a group listen in our participate or do something similar to that, we can give you the name of the person in Salt Lake and you could be in touch with them. It’s an exciting opportunity for Americans who believe in this third narrative of working together to celebrate themselves and send a message back to the rest of the county. And I’m also excited that they’re waiting until after the election. Because before the election everyone is wondering who is going to win. By November 12th someone will have won and we’ll need to learn once again how to work together. Marilyn: Great and for those of you on this call, you can contact us directly at the Charter and we’ll be very happy to put you in touch with John Kesler who is in Utah and is responsible for our Compassionate Utah Project and also John Steiner from the Bridge Alliance. We’re looking forward to that conversation. Anyone else who has a thought or question? Judy: I am Judy Gates and I am from Marblehead, Massachusetts. One of the things that hasn’t been mentioned and I would assume someone there knows about it, is the group No Label (www.nolabel.org) it was formed back in 2010 and gathered people from the 50 states in an effort to encourage members of congress from both parties to address the issues coming up to try to work together across the aisle. At the time I went to the first meeting in New York and was very excited about it, and hoped that we would reinvent democracy. Obviously that hasn’t happened, though I do think they’ve done some good work. Mark, are you familiar with that group or do you have any comments? Mark: Yes, I work closely with No Labels and I write about them at length as an illustration of moving from campaigning to governance. They have over 90 members from the House of Representatives who are part of a problem solving caucus. And at least in theory, that problem solving caucus is going to work across the aisle on some very tough issues facing America. I had the same high hopes for No Labels – and I still do. But they’re up against something very challenging, and they need all of us. They took an inside the beltway approach that said “okay if we can get these members from the House of Representatives to work together, they can create this third force to solve problems.” The missing ingredient in their organization is all of us. They don’t have hundreds of thousands of Americans organized and supporting them to work together. Hillary Clinton and Donald Trump have hundreds of thousands of supporters working to get each of them elected. But there aren’t millions of us doing what problem solvers like No Labels need. That’s why I profiled 40 different organizations including No Labels in my books because I feel like it’s not just No Labels that has the answer, it’s not just Convergence or Living Room Conversations. They’re all part of a movement, a movement that needs us. There are people out there to be the bridge builders. I appreciate you bringing up No Labels, and I encourage all of you to look it up. There’s nothing No Labels can do between now and the election, but after the election I think that No Labels will probably try to get whoever is elected to pick up their national plan for the future. Thank you again for bringing up No Labels, they are one of the central organizations in this movement. Marilyn: Great, thank you both. Lynn, your mic is on. Lynn Mystic Healer: Thank you for what you’re doing. We have all these projects and I’m wondering how we can work together to get all the militaries worldwide to stand down and go green. One of the ways is so recreate a paradigm of coping skills that move away from xenophobia and gun violence and all of the warring and drugging. So I’m working and looking for help on developing community services jobs, and community means we don’t care what race religion or gender you are, and have a basic guaranteed income (I was thinking around $2600 a month). Right now we’re up against paid volunteers that may go mandatory for draft and armed services with all these benefits and include more militarized police training. So I’d really like help to get these new helping healing caring sharing, all these new services developed. Moving towards a new paradigm existence where communities work together and have the funding. We have all these spirit healing programs and people but they aren’t being paid, all the money is going to fossil fuels and warring and killing and jailing. So that’s what I’m looking for help with. Do you have any ideas? Mark: Absolutely, I really appreciate you bringing up the military and defense spending. What struck me is how ineffective I was while working on this issue. I can hear that frustration in your voice, too. Here we are many of us saying defense spending is too high. It’s gotten higher and higher since WWII. I recently facilitated a meeting off the coast of Georgia funded by organizations all the way from the tea part on the right to very progressive groups on the left, all of whom saying we could make our defense budget smaller smarter and leaner. I want to bring that up because when you actually sit down with Americans, many Americans agree with you. But we’re being exploited by partisan politics in such a way that neither party can take a stand on this. We are facing probably one of the deepest problems of our democracy which is why I’m so glad you brought it up, which is that in the democratic and republican parties, many of the congressional districts have military industries located in them. They bring jobs revenue and taxes into the districts of both democrats and republicans. One of the colleagues at the meeting said “We need a threat based defense budget, not a contractor based defense budget.” This was by the way a colonel in the army who said that. Why is this such a fundamental issue for our democracy and why is it such a great place for transpartisanship? That huge chunk of money that goes down the rabbit hole is being wasted. The analogy I use is it’s as if the father of the family was a drunk and went to the bar every day and spent all the money that the family needs on food and schooling and clothes. That’s kind of where we are today and the defense department is that. I’m very pleased to say this is no longer just a liberal issue. This is also a conservative issue. Conservatives hate wasting money and conservatives hate big government. And there is no bigger or more wasteful part of the government than the defense department. I’ll just flag this and say I believe there’s a cross spectrum coalition waiting to be born that says “lets spend our defense dollars more wisely.” And I just want to say something about women, there’s a number of women’s organizations that say “If it was the women in America talking to the women in Iraq we would be able to find some different ways of going about this.” I encourage you to look into the projects run by various women peace organizations who are literally saying that women to women diplomacy could solve a lot of problems that are now not being addressed because they don’t have those voices front and center. So thank you for bringing up that issue and thank you for what you’re doing. Back to you Marilyn. Marilyn: Lynn, I’d like to put you in touch with John Kesler and John Steiner. I wonder if there might be a place for a session on this conversation happening November 12th. I encourage everyone to pay attention to the newsletters that will be coming out over the next month or so which will continually talk about the registration for some of these events. We have time for one more question, Jerry your mic is on. Jerry: Hi my name is Jerry Stark and I am from Baton Rouge, Louisiana. Our community is so conservative that we can’t even get an ordinate passed to be accepting of all people. I have a dream that one day we will be a compassionate community and I am holding on to that dream. My comment is that I am happy to be participating in Mark’s course on the Shift Network, it’s really a wonderful course and I hope others will consider that course as well. 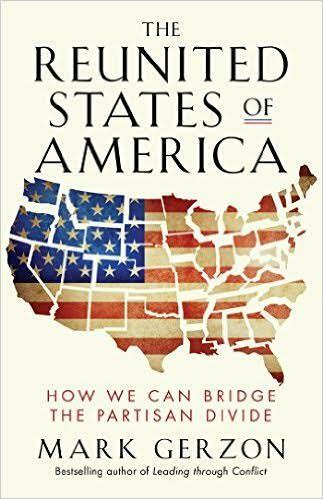 It strikes me that something that’s in alignment with the Reunited States of America is the concept of non-dualism that is written and spoken about extensively by Father Richard Rohr. That is certainly a practice that I find helpful to try to stay in that transpartisan space. Also I would like to offer that I am currently involved with a book group in Baton Rouge, and we are doing the Reunited States of America. It was the first book that our group (we call ourselves Compassion in Action) chose to do where no member of the group had read the entire book cover to cover, but based on the recommendation of the CCI we took the leap and I’m happy to say that thus far it’s going well. So to the young woman in the beginning asking what she could do – besides a living room conversation, perhaps a book discussion using Mark’s book as a premise! Marilyn: Great, thank you so much and thank you everyone especially Mark for participating on this call. I want to remind you all that we have two more Global Reads coming up. The next one is on Saturday October 22nd with Kathleen Dean Moore and her new book Great Tide Rising. Kathleen has been with us several times before, she’s an environmentalist and she has been a distinguished professor of Philosophy at Oregon State University. She teaches critical thinking and environmental ethics. I find that everything that she talks about is almost poetry in nature. Then we have a very special Global Read on February 22nd called How Fast Can You Run by Harriet Levin Millan. I invite you to go to our website and do a search, put in “How Fast Can You Run” and you’ll get some information about it, though certainly we’ll be writing more as the time draws closer. We’re very excited. The book hasn’t come out yet, I believe it will be released on October 28th. We won’t only have the author of the book but also the chief protagonist. This is a book that I really think is generational. We are really promoting it a great deal in schools but certainly we want an intergenerational and international audience to be a part of it as we do with all of our Global Reads. Thank you again everyone for participating on a Saturday. We have a tradition here at the Charter. At the end of all of our calls we open our mics to take a moment to say thank you and goodbye to each other. Thank you all. Have a very good week and we hope to have you all back on all of our calls.